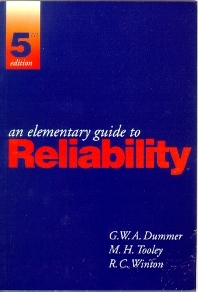 This classic text has now been completely revised and updated, making it an ideal introductory course in reliability for a wide range of engineering qualifications, including City & Guilds 8030 and HNC/Ds. A new chapter focuses on the role of the microprocessor and microcomputer controller, and the use of algorithms for monitoring system performance. The addition of numerous problems, self-check questions and exam-style questions makes this an extremely useful book for courses with an element of independent study. G W A Dummer was born in 1909, and his career included pioneering work in the field of radar. Working on radar reliability in the early fifties, he became the first person in the world to propose and pioneer the integrated circuit. In recognition of his distinguished career, he has received the USA Medal of Freedom and the MBE. R C Winton, MBE, worked for Mullard for 40 years, and played an important role on may committees such as the CBI Education and Training Committee. He was also a key figure at the IEEE, becoming Secretary of the UK and Republic of Ireland section.